Hi everyone! 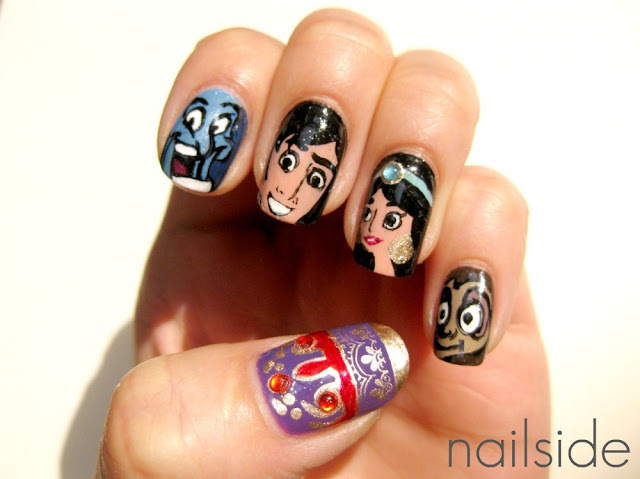 A little while ago I made this Aladdin mani for the Disney nail art contest by Orlica at Confessions of a Polishaholic. So my Disney mani was inspired by Aladdin, my absolute favorite Disney-movie. When I was a little kid, I already loved the movie and had a crush on Aladdin, lol! And now that I'm older I still enjoy Aladdin, maybe even more because now I finally understand all the words, songs and jokes :) Everything about the movie is just wonderful; the visuals, the script, the AMAZING songs and of course all the characters! So on my nails I have 5 favorite characters depicted, the magic carpet, Genie, Aladdin, Jasmine and of course little Abu! All are freehanded with tiny brushes and an ocean of patience... And as a finishing touch I added some rhinestones to the magic carpet on my thumb and Jasmine's headband. So go check out all the 22(!) amazing entries and vote for mine if you truly think it deserves to win! And make sure you're a GFC follower of Confessions of a Polishaholic or you won't be able to vote! EDIT: The other day Orlica announced the winner of the contest, which was Kleopatre. She made a really cool Cruella de Vill mani, it was one of my favorites in the competition and truly deserved to win. So sadly I didn't even make it to the top three, haha, but I had a lot of fun making the Aladdin mani and just wanted to say thanks to those who had voted for me :) So thank you! Wauw die is heeeeel gaaf! Please, just ensure that your voters are my GFC followers ;) Thanks! Woah this is so perfect that I first thought it was those fake nails with pictures on it!! Very well done! OMG, that's so unbelievably cool! i love the thumb especially. That is incredible. You are so talented. I love it! Wow, so many comments! Thanks so much guys for all the love! @Lydiane Gaborieau: That's a big compliment, thank you very much! @Minty: Thank you for the support!! Though it will be very tough to win. So many great entries! @Minnie: Thank you! Hahah, yes Aladdin was a little crush, but can you blame me?! Lol! I loved your entry the best btw! It really captures the fantasy and mystery of the Cinderella/Disney theme. Oh my gosh these are soo cute ! They arre also so fun. Wow is the first thing I thought when I saw these. They are flawless and very precise!!! The faces are so detailed, amazing!!! Oh my gosh these are amazing!!! I love your nail art!!! And Jasmine has been my fave princess ever since I was 7! Imagine my delight when I found this manicure!!! I'm new to your blog, but you should've won! Yours was the most neat as well as creative.